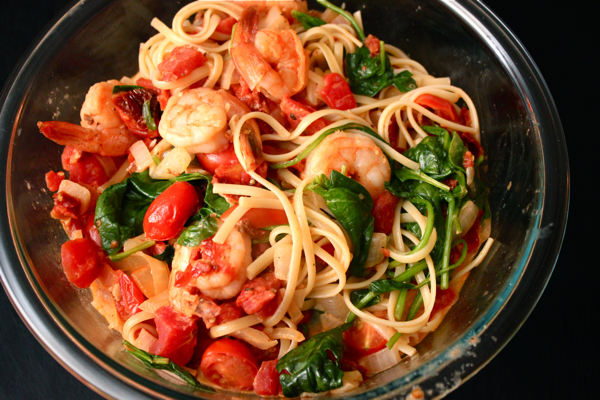 If you like spicy pasta, you’ll go nuts for this one. I’ve been waiting to make it for months, ever since my friend shared his wildly successful kitchen experimentation with me. I started craving it on the spot! I started checking in at Trader Joe’s, hoping they would stock frozen, raw shrimp instead of frozen, cooked shrimp. After three months, I couldn’t wait any longer. I gave in and bought the cooked shrimp, and I’m glad I did. It’s hard to have a food craving go unfulfilled for so long! This pasta is easy to make, and it’s full of spicy hot, satisfying flavor. To start, bring a pot of water to boil, and cook some linguine according to the package’s instructions. While the pasta cooks, dice 1/2 onion and mince 3 garlic cloves. Add them to a pan with olive oil to soften. The sweetness of the onions really helps to balance the spice in this dish, so don’t neglect them. Once the onions and garlic are ready, add in 1 can of diced tomatoes, and 2-3 minced chipotle peppers depending on the amount of heat you desire. Let the sauce simmer for a few minutes until the tomatoes start to break down. While that happens, halve a handful of cherry tomatoes. 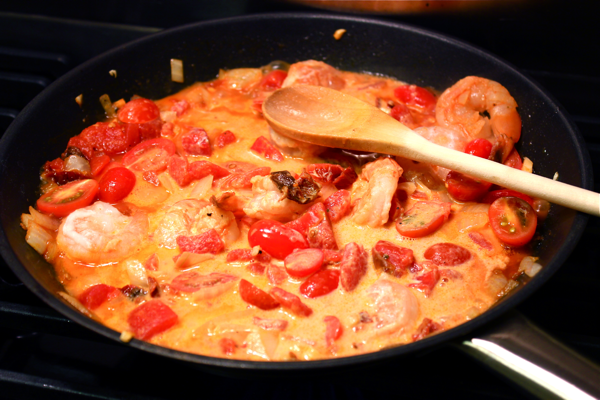 If you’re cooking with raw shrimp, add them to the broken down sauce along with the cherry tomatoes and 1-3 tablespoons of cream, depending on your tolerance for unhealthy ingredients. 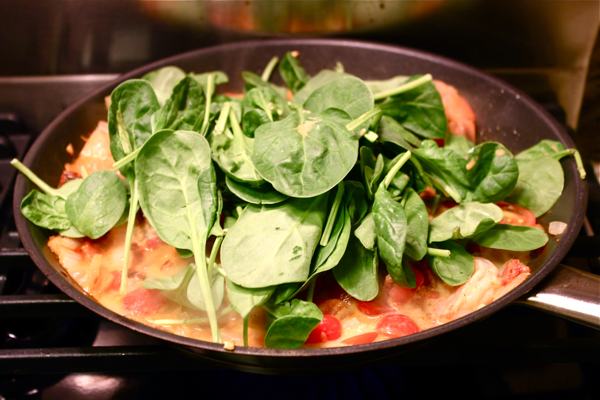 Add 2 heaping handfuls of baby spinach leaves to the pan, and mix them around so they wilt. 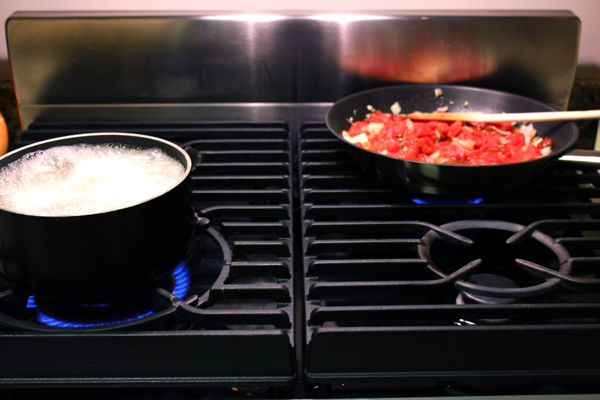 You can add a lid to the pan if you want to speed this process along. 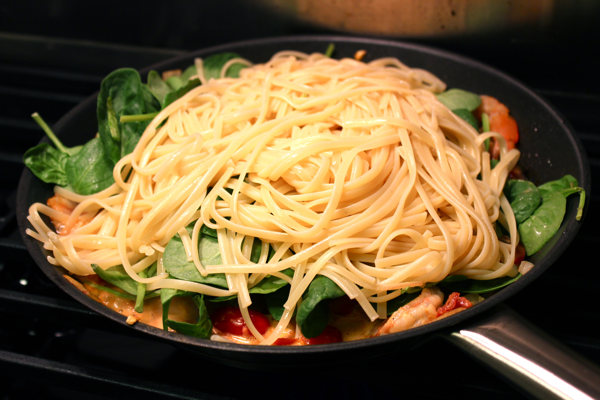 When the spinach has almost wilted, add your linguine into the pan, and stir it around so it can absorb and thicken the sauce. 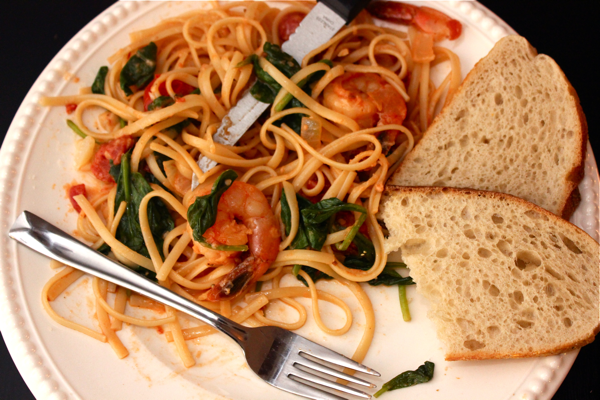 If you’re using cooked shrimp, you can add them in with the linguine. 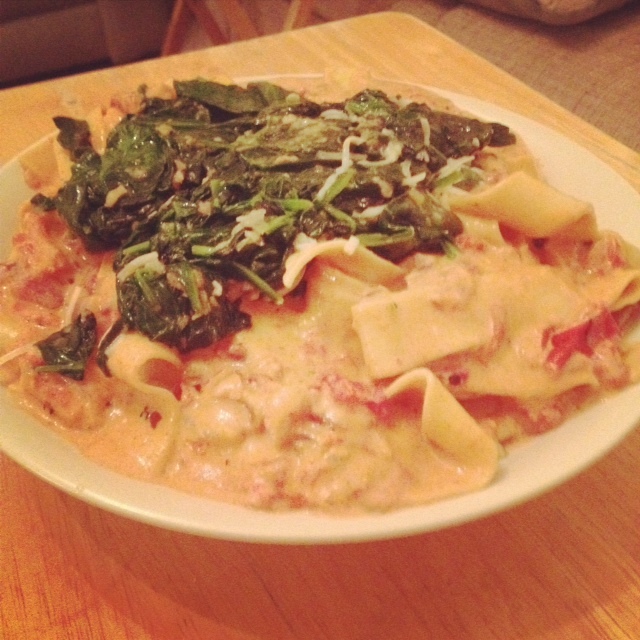 Once everything is nice and cooked together, get ready to gobble. But first, top the pasta with some freshly grated parmesan cheese. I like serving this kind of pasta with toasty bread, even though it’s a carb overload, because it can ease the chipotles’ heat, soak up some sauce, or help scoop the pasta. This is a relatively quick and easy dinner, and if my description of it has given you a craving, then please don’t be like me. Satisfy it immediately! Looks like you made a few modifications, but it seems to have come out pretty nicely. Here’s what mine looked like, for comparison’s sake (excuse the cell phone picture). I couldn’t muster the strength for the spicy diced tomatoes, but yours looks great too! Uh oh, you’re making me hungry again. Given the sheer amount of cream and parmesan cheese I used in my version, I’d advocate against eating this more than once per year. I made this a about a year ago and had forgotten about it, until last night when my husband and I were looking for spinach recipes. Guess what’s for dinner tonight? It will be on our weekly menu for now on. BTW my 14 year old son doesn’t like pasta, but ask for seconds and sometimes thirds. Thank you so much for sharing your recipes and life with us.